Games that I’ve designed that have some sort of non-digital element, such as tabletop games, physical activities, or augmented reality experiences. An augmented reality app designed for the American Museum of Natural History. Players would use the app and travel between exhibits, playing mini-games while learning about microbial life and its impact on the environment. I designed the prototype for the game, created user flows, conducted playtest sessions, and balanced the difficulty progression. 1v1 space combat that uses simultaneous movement and push your luck dice mechanics to create a lighthearted but engrossing strategy game. 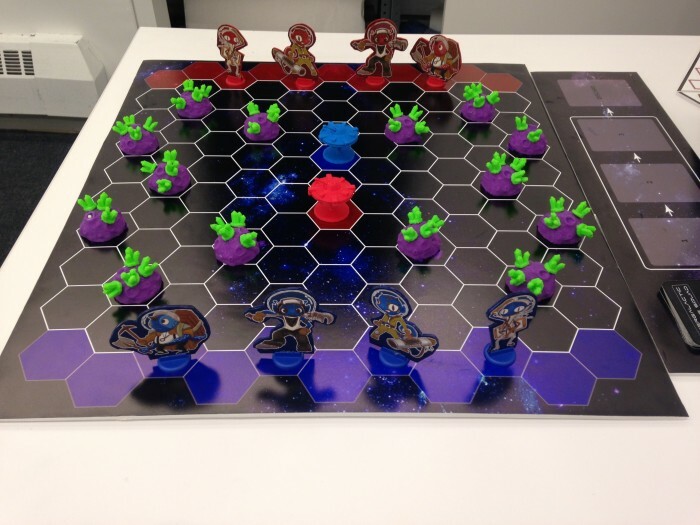 The game pieces were 3D printed, built out of cardboard, or laser cut, a level of polish never before seen in a 4-week assignment at the NYU Game Center. Featured at Indiecade East 2015. A pirate-themed treasure hunt where players will solve puzzles, search for clues, and face deadly foes around Dumbo to eventually find and unlock the treasure of the ancient ghost pirate Captain Coral. Featured at Come Out and Play 2016.